MANILA, Philippines (CNS) — New situations are opportunities to learn new things, even about the 78-year-old Pope Francis. After two days of watching the pope tenaciously keep his appointments in the Philippines despite pouring rain Jan. 17-18, one lesson is that the papal wardrobe needs to be expanded to include rain gear. A white umbrella — the usual Vatican response to a drizzle — is not adequate. And cancelling or moving an event indoors — the usual Vatican response to a heavy rain — is not acceptable to Pope Francis if his appointment is with thousands or even millions of predominantly poor people. Pope Francis, the grandson of Italian immigrants, takes a typically Italian approach to weather: it requires protection. On sunny days in St. Peter’s Square, he urges — sometimes with an almost scolding look — parents to put hats on their children. On cold days, he wears a long white overcoat and asks parents of the underdressed where their children’s coats are. When a guard passes a baby to him on a cold day, he often adjusts the child’s coat or scarf to ensure proper bundling. Much more importantly, Bishop Mylo Vergara of Pasig, head of the media committee for Pope Francis’ visit, said the wet and stormy weather — which included the approach of a category-two tropical storm in Tacloban — taught people how seriously Pope Francis takes his promises to the poor and suffering. Because the pilots flying him to Tacloban, the area devastated by Typhoon Haiyan in 2013, insisted he leave the area before 1 p.m., instead of the originally scheduled 5 p.m., he left Manila an hour early to get there, “he abbreviated everything, but he did all the events,” the bishop said. “The pope is a pope of surprises, but God also surprised him,” the bishop said. The rain did not dampen the spirits of the people, and the pope did not let them down. The Philippines trip also showed the energy the pope draws from crowds at mega events, while simultaneously being able to zoom in on micro details and bring the crowd with him. Some 30,000 exuberant youths congregated in the rain Jan. 18 at the University of Santo Tomas. 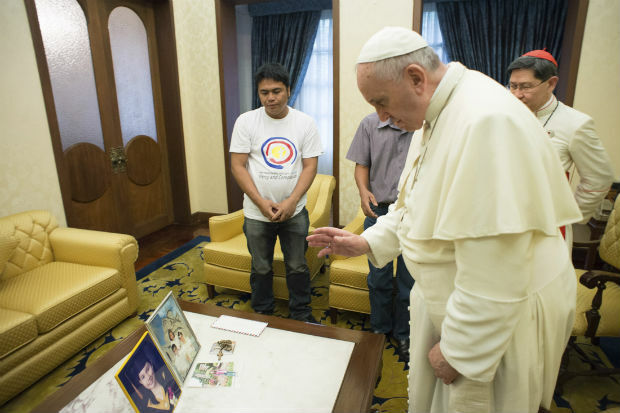 The pope gathered them and drew them into prayers for the 27-year-old Catholic Relief Services worker, Kristel Padasas, who died the day before after an accident at the Tacloban Mass site. Two other elements at the youth gathering did not escape the pope’s eye for detail: first, the fact that of the four youths chosen to address him, only one was female — a situation he said should be rectified the next time a pope visits. And, second: tears. People get emotional when a pope is around. Many are overcome with tears after even the most fleeting moment with the pope. But the tears shed by 12-year-old Glyzelle Palomar were different. The pope honored the tears of the girl rescued from the streets and then helped the 30,000 youths present reflect on the role of tears in response to her suffering and the suffering of so many innocents. “Certain realities in life can only be seen through eyes cleansed by tears,” the pope told them. And the only worthy response to questions about why God allows suffering is tears of compassion, he said. 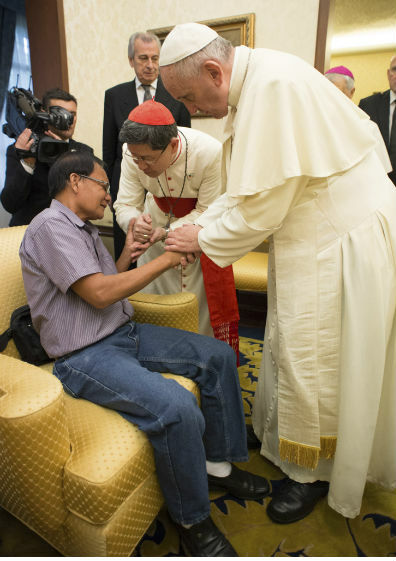 Another thing people learned about Pope Francis — something Cardinal Luis Antonio Tagle of Manila said tipped him off — was that if the pope insists on having nearby Msgr. Mark Miles, a native of Gibraltar who works in the Secretariat of State, that means he will set aside his prepared text and speak from the heart, in Spanish. Msgr. Miles translates the pope’s words into English. A smaller detail that the pope attended to is connected to his respect for popular piety, a respect born and nurtured in his native Argentina. He shares the common people’s tangible Marian devotion, which leads him to tenderly touch or kiss images of her, but also reflects a sense that Mary is “mama,” as he said at Santo Tomas, and one can grab on to her skirt when the going gets rough. He blessed the statues of the Holy Child Jesus people carried with them to Mass in Manila Jan. 18, the Holy Child feast day in the Philippines. The pope was given a copy of the statue, which ended up being his backseat driver as he toured the crowds in the popemobile after Mass. After a song, altar servers took the pope’s taper from him, and he was handed his crozier for the final blessing. But the pope saw all the people still holding their candles, so he asked his master of ceremonies to give back his candle. this story is so touching. It brought tears to my eyes. The pope is one of a kind. Such a gentle soul, loved by the people.